YaSM®  and ITIL®  have common roots and share the same principles, so users familiar with ITIL will find the YaSM model and the YaSM processes easy to read. 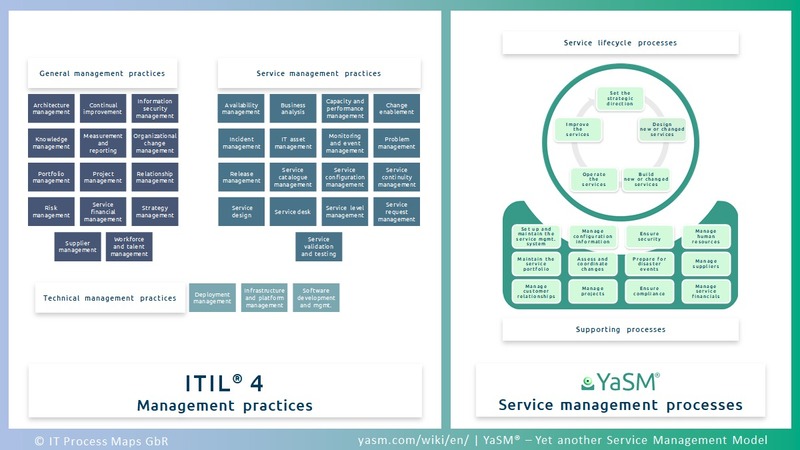 This page provides a detailed account of how the YaSM service management model relates to the latest edition of ITIL 4. If your organization uses ITIL V3, there is another page with a comparison between YaSM and ITIL V3 (ITIL 2011). 2 ITIL 4 processes and ITIL 4 process templates? ITIL® has a history of some 30 years. It has gone through several revisions and has grown into a large and sophisticated framework that many find difficult to understand. and ITIL 4 describes a service value system including 34 service management practices. The YaSM model describes a set of streamlined service management processes, with a clear-cut structure. This does not mean that YaSM is simplistic: Every ITIL process or practice serves a purpose, and YaSM does not merely omit some processes, as various approaches for 'light' or 'lean' ITIL would advocate. Rather, YaSM is less complex and easier to read because it introduces a simple and intuitive process structure. The YaSM model follows the principles behind ITIL - and also the guidance provided in other service management frameworks and approaches, such as COBIT®, SIAM® and VeriSM™. What is more, the YaSM processes are 100% compatible with the requirements of ISO 20000, dem internationalen Standard für Service-Management. Note: YaSM® is an independent service management model and is not officially endorsed by the owners of ITIL®. ITIL 4 processes and ITIL 4 process templates? Earlier versions of ITIL were organized around service management processes, but ITIL 4 describes a service value system and service management practices that do not specifically relate to processes. So the question arises: Can a service management process model like YaSM define ITIL® 4 processes (see fig. 2), and is it possible to provide ITIL 4 process templates? The answer is yes, although translating ITIL 4 into process templates is not as straightforward as it is with ITIL V3. There is no defined set of ITIL 4 processes and to work out ITIL 4-aligned processes, based on the ITIL 4 practices, users must apply their own judgement. Not every ITIL 4 practice can be translated into a process (some describe management techniques and principles rather than activities). 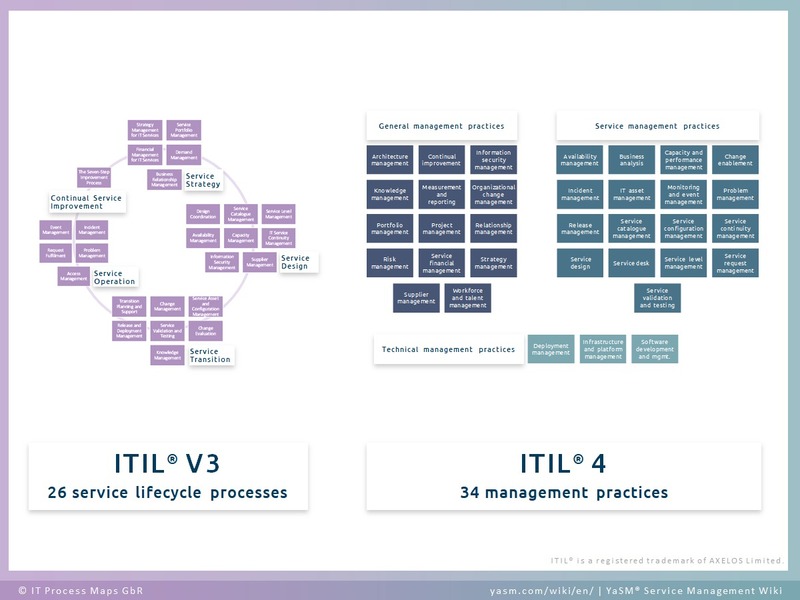 But a comparison between ITIL 4 and ITIL V3 shows that most of the ITIL 4 practices can be traced back to ITIL V3 processes. For example, the ITIL 4 practice of incident management clearly corresponds to the familiar incident management process. It is therefore not wrong to argue that ITIL 4 includes guidance for processes, and providing templates for ITIL 4 processes is quite feasible. What is more, ITIL 4 is not prescriptive and in favor of "keeping things simple and practical". This presents an opportunity for a fresh start with a less complex, streamlined and well-defined set of ITIL 4 process templates, as provided in the YaSM model. These templates can be easily adapted to create tailor-made processes, in line with the needs of specific organizations. In the four dimensions model, ITIL 4 relates to "value streams and processes", and organizations are advised to identify their processes and value streams. But there is often confusion around the two concepts because they are somewhat similar: Both describe sequences of activities and both create value. So should organizations focus on processes or value streams? Rules and compliance requirements are observed. Typical examples for service management processes are service portfolio management, incident management, change management, etc. Processes are often documented in a process model, for which the YaSM Process Map provides an example and a complete set of service management process templates. Value streams are somewhat similar to processes, but their purpose is different: Value streams are mostly representations of the steps required to deliver a service to a customer. They show "end-to-end" views and typically start with a customer need and end with that need being fulfilled. Value streams are often included in service definitions to describe how value is created and how users interact with the service. An example of a value stream could be the sequence of steps required for the onboarding of new customers to a specific service. The following table provides an overview of the ITIL 4 components versus processes and content from the YaSM service management model. The first part of ITIL describes the key concepts of service management. The YaSM model is based on these concepts and explains how organizations can bring them to life in their service management processes. ITIL defines four dimensions that should be considered to ensure a holistic approach to service management: People, information and technology, partners and suppliers, as well as value streams and processes. These dimensions are applicable to the service value system in general and to specific services. The YaSM processes are designed to consider these key aspects of service management as services are designed, operated and continually improved. The ITIL service value system (SVS) describes "how all the components and activities in the organization work together to enable value creation". It includes five components: Guiding principles, governance, service value chain, practices and continual improvement. The ITIL SVS is in some ways similar to the holistic systems approach known from other service management frameworks and standards, such as ISO 20000 and VeriSM. The YaSM model supports organizations that wish to adopt a systems approach for managing their services, providing detailed processes, document templates, policies, etc. The YaSM model helps organizations to apply many of these principles in practice. The governance component of the ITIL service value system is about directing and controlling the organization. The YaSM processes include a number of activities that are concerned with governance, such as establishing policies, performing reviews at different organizational levels, defining the service strategy and monitoring performance. The ITIL service value chain is the central element in the ITIL service value system. It presents the key activities required to create value for customers. The six value chain activities are: Plan, improve, engage, design and transition, obtain / build, deliver and support. The YaSM model describes 19 service management processes. 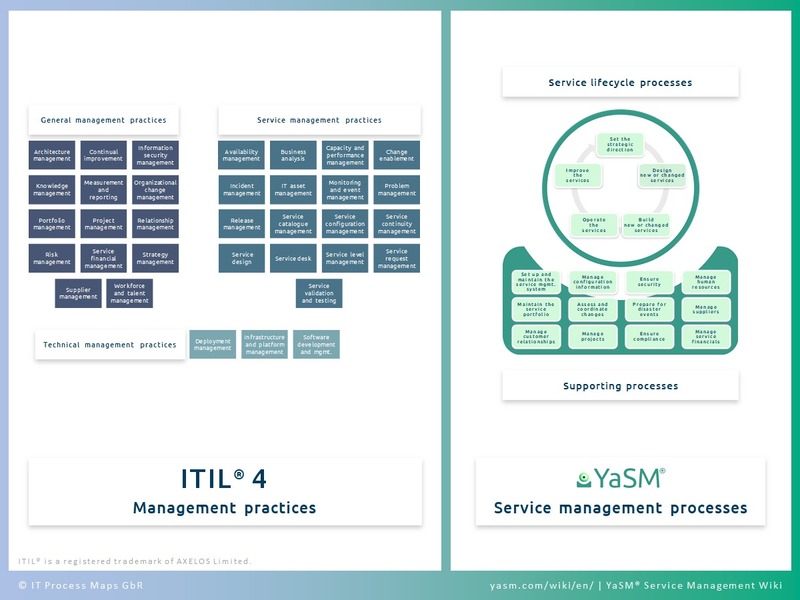 This configuration is not identical with the ITIL 4 service value chain, but on a more detailed level the activities in the YaSM processes broadly correspond to the value chain activities. The ITIL model for continual improvement describes a structured approach to identifying and implementing improvements that can be used at all levels of the organization. The YaSM model applies this approach in a number of processes, such as the service improvement process. ITIL 4 presents 34 practices as "sets of organizational resources designed for performing work or accomplishing an objective". These practices are integrated into the YaSM processes. ITIL 4 describes 34 management practices as "organizational resources designed for performing work or accomplishing an objective". Some of these practices are general management practices or methods adopted from technology management, but most of them correspond to the processes known from the previous edition of ITIL V3 and other service management frameworks. The YaSM model is thus a good starting point for defining ITIL 4 processes. If your organization uses ITIL V3, there is another page with a comparison between YaSM and ITIL V3 (ITIL 2011). This ITIL 4 practice discusses the importance of architecture management and how the various types of architecture support the service value chain. Several YaSM processes are concerned with managing the different ITIL 4 architecture domains. Architecture domains include services, processes, capabilities, information and data, technology, etc. ITIL 4 advises that organizations use a continual improvement register (CRI) to manage their improvement ideas. In the YaSM model, improvement ideas are managed through the service and process improvement plans. The ITIL 4 practice of knowledge management is concerned with collecting and sharing knowledge of all types in various forms. YaSM takes the view that knowledge is managed, and knowledge management principles are used in many service management processes. For example, the incident management process maintains a knowledge base to support the resolution of service incidents. This ITIL 4 practice is about collecting all relevant information to support decision making in the organization. SP1: Set up and maintain the service management system (monitoring and reporting of process metrics). ITIL 4 refers to critical success factors (CSFs) and key performance indicators (KPIs). The YaSM model uses terms that are similar in meaning, such as process metrics and service levels. Organizational change management (OCM) is a set of techniques and capabilities rather than a process. OCM addresses the human side of changes and aims to ensure that changes are implemented smoothly. OCM can be applied in many situations, whenever the organization needs to change its processes, behaviors, culture, etc. The ITIL 4 practice of portfolio management refers to various types of portfolios, such as services, projects and customers. Major decisions about these portfolios are taken at the strategic level. For example, the strategic process in YaSM is responsible for determining the right mix of services to be offered to customers. The relationship management practice in ITIL 4 is broader in scope and refers to relationships with all stakeholders of the organization, including customers. The strategic process assesses risks to the organization’s business model. Security management addresses security risks. Continuity management deals with risks from major events and disasters. The YaSM model does not contain a specific availability management process. Rather, service availability is treated as an aspect of services to be managed through the service lifecycle processes. Availability requirements are defined during the service design stage, and services are then built with those requirements in mind. The operating process will be responsible for measuring the achieved availability levels, which allows the service improvement process to take action if availability must be enhanced. Some of these techniques are applied in the YaSM processes, for instance as service requirements are defined in the service design process. YaSM does not contain a specific capacity management process but treats service capacity and performance as aspects to be managed through the service lifecycle processes. Capacity and performance requirements are defined during the service design stage, and services are then built with those requirements in mind. The operating process will be responsible for measuring capacity and performance levels, which allows the service improvement process to take action if capacity must be adjusted or performance improved. YaSM takes the view that the management of incidents and service requests are very similar in nature. There is thus one process in YaSM to handle incidents as well as service requests. The key activities of IT asset management as described in ITIL 4, such as maintaining a list of IT assets, recording changes and providing current information about IT assets, are included in the YaSM process for managing configuration information. In the YaSM model, new or changed services are made available for use through the service implementation process. Smaller, incremental changes to services (as in Agile/DevOps environments) are typically managed through the service improvement process. The YaSM process for maintaining the service portfolio contains activities for publishing service catalogs and keeping them consistent and up to date, in line with updates to the service portfolio. The service desk practice highlights the key aspects to be considered when offering a single point of contact with customers and users. It does not describe service desk activities. In the YaSM model, the typical service desk activities are described in the incident and service request resolution process. In the YaSM model, several processes are concerned with managing service levels throughout the service lifecycle. The required service levels - as well as the required service outcomes - are defined in the service design stage, based on the needs of the customers. Monitoring and reporting of service levels is the responsibility of service operation. The service improvement process will review the achieved service levels against the committed levels and initiate corrective action if required. YaSM does not contain a separate validation and testing process. Rather, the service build process contains the activities for testing the infrastructure and other capabilities required for a new or changed service. This practice explains various approaches to the deployment of hardware, software and other service components into the live environment. LP5: Improve the services (deployment of service improvements). This ITIL practice is about providing the right mix of technologies to the organization and governing the use of technology solutions. It includes guidance on cloud services and cloud computing. The infrastructure and platform management practice can be applied in various YaSM processes, such as the strategic and service design processes. ITIL (and all other service management frameworks) do not provide detailed guidance on software development. The YaSM model describes the interfaces with software development, but otherwise it is considered a discipline of its own and is outside the scope of the YaSM service management processes. [IT Process Wiki]. -- S. Kempter & Kempter, A.: "IT Process Wiki". -- The Wiki about the IT Infrastructure Library ITIL® (ITIL 4, ITIL 2011, ITIL V3 & V2), ISO 20000 and IT Service Management (ITSM). - IT Process Maps; Lindau (Bodensee), Germany. [IT Process Wiki - ITIL Processes]. -- S. Kempter: IT Process Wiki, "ITIL Processes". - IT Process Maps; Lindau (Bodensee), Germany. YaSM stands for "Yet another Service Management Model". YaSM® is a registered trademark of IT Process Maps GbR. The ITIL guidance referenced in this table is based on ITIL 4 Foundation, published in February 2019. 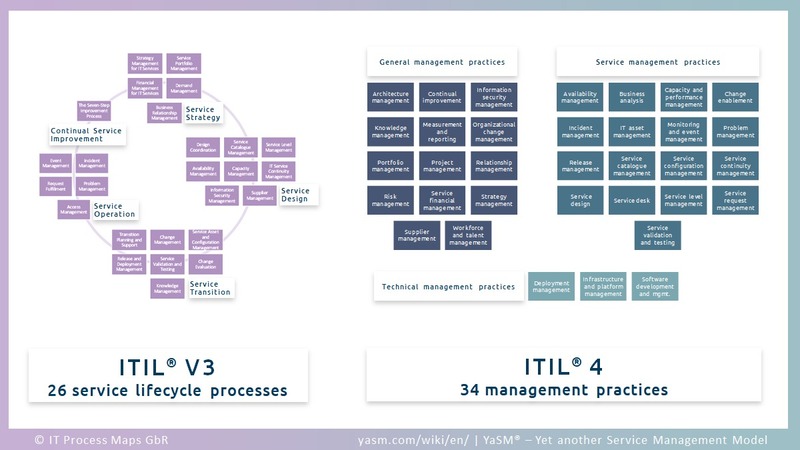 Is based on: The YaSM Process Map - Document: "YaSM and ITIL®"
This page was last edited on 21 April 2019, at 18:19.